Interesting..am hoping at the end it will be Adam and daisy and John - the trio of this trilogy( although Kyla is antagonist too). Makng Star Wars wrote: Sometime ago, I spoke to a source about Star Wars: Episode IX who told me that things would get interesting for Kylo Ren when a threat from The Beyond reveals itself, making Kylo Ren vulnerable. This threat would serve as a motivating factor for Kylo and Rey’s interactions as the story progressed but the source wasn’t sure which act it happened in or how it unfolded. It should be noted that a lot of what that source told me, in terms of accuracy, has come to fruition since that conversation. However, with just that info in hand, the understandable but knee jerk assumptions from fans would likely have gone right to the Expanded Universe and The Yuuzhan Vong. Now, I think I may have got the information that relieves that ambiguity a bit more. Very recently, another source with a great track record said it was really important that The Knights of Ren have returned from The Beyond. The pregnant pause after that bit of information has led me to believe there’s a lot to that. The fact that there is some plot significance to the Knights of Ren in the film is something else most sources have also echoed. Another rumor I have heard a few times pertains to those red troopers I wrote about sometime ago. I have heard that the red troopers are called “Sith Stormtroopers.” Now, are they called that behind the scenes because Kylo is actually a Sith Lord now or do we have a game of synonyms at play where “evil” is the same as “Sith”? Anyways, the pertinent info here is that these red troopers answer only to Kylo Ren and The Knights of Ren exclusively. Maybe they’re just the Knights of Ren’s infantry? It also seems that in Episode IX Kylo has accumulated private armies and militias under The First Order banner to strengthen any opposition to his rule. Worlds that have their own defense forces are also aligned with The First Order. So it sounds like the scope of the battles in the film could be pretty large and not just have the rebellion fighting against white Stormtroopers. Do these rumors connect? Let us speculate that they do as they really might connect like this. It would seem Kylo Ren is putting together a large force to dominate the galaxy. But the first rumor says that a threat from The Beyond eventually reunites Kylo Ren with Rey (who seems to pretty much have the same hair as last time, by the way). Maybe the Knights of Ren are like The Sith. Perhaps the #2 person of power in the knight’s order knows that they have to kill Kylo to become The Supreme Leader and things get out of control for Kylo as the Knights of Ren, now generals of The First Order, try and usurp The Supreme Leader just like Kylo Ren did in The Last Jedi? This is pure speculation on my part, but if these rumors are all accurate, that could potentially be how these things connect together. Remember, these are real rumors that have come with information that has been validated in various aspects of Star Wars on screen. So the rumors by themselves have validity. The connective tissue between them was speculation about how they connect, assuming all the building blocks to that narrative have been interpreted correctly. If this threat creates a team-up again, then many of us called it sometime ago I think. This sounds extremely plausible, and actually makes more sense than any other rumor I've heard. This also sounds a bit too much like Palpatine's story about a darkness he sensed. Edit: Ok it is Palaptine's story it seems. I knew it sounded familiar! Not sure if it connects. It could also be referring to the Acolytes of the Beyond as another reddit user pointed out. Much speculation to be had for sure now! not sure how I feel about these leaks/theories...I personally prefer a character driven story especially for the last episode of the sequel trilogy. Of course we can have both- huge stakes & character growth...but with so much going on I'm not sure how much time there is to focus on relationships and emotions. I know MSW is usually a good reliable source but "Sith troopers" - seriously? And I really really hope they won't bring in the Yuuzahn Vong into the new Canon - I already read this story years ago in Legends I have no desire the see a recycled version of that on screen. So whatever "big foreign enemy" they bring in from the unknown regions- please let it be something new and original and something that serves a larger purpose not only a huge fan service battle. By the way- on Twitter there are rumors the Titel for IX being "Ashes of the Empire"- where the Sith is that coming from? Threat from the Beyond? The source of the Dark Side that was mentioned in Aftermath? Episode IX: The Phantom Menace Strikes Back . @ISeeAnIsland - interesting, thanks for sharing! I've gotta read the aftermath trilogy again! I want to revisit what goes on with the observatory too..
Yupe Tashu was creepy as, and I'm a sucker for any of the Knights of Ren or Acolytes of the Beyond stuff! But.. I'm looking forward to whatever they come up with IX! As long as she does not have her 3 buns again, I am cool with it I loved her TLJ look. And I definetly recommend the Aftermath trilogy! People complained about the first book because of the prose though. I listened to audiobooks and they were fantastic. @Man Without A Star wrote: Threat from the Beyond? The source of the Dark Side that was mentioned in Aftermath? That's what it seems to be, unless JJ came up with something totally different. I've wondered for awhile now if things were heading in that direction. It might not be exactly as MSW said, but some of it even connects with events in Poe's story. If this is all true, anyone who hasn't read the books might be lost or confused. @DeeBee wrote: @ISeeAnIsland - interesting, thanks for sharing! What are the Aftermath trilogy exactly? Are they the ones that tell how Snoke watched Ben even before he was born? About the Sith Trooper thing. Could that be a code name for them and not their actual name? Like people who thought Mara would be in IX, but it's just a code name for Keri's character I think. Edit - basically Abeloth is like a female Sauron and the grysks could be like orcs ( lord of the rings ). Here's a way out there theory. What if her parents had only adopted her, but Rey actually comes from the Unknown Regions? The place where Palpatine gained his powers? Where he sensed a great disturbance in the Force? Maybe that's why Rey recognized Ahch-To in her dreams? Yes, it was mentioned there. Big deal of the books was Palpatine's contingency plan to scuttle the Empire in the case of his demise. He built these stations called observatories, which looked into the unknown regions. He believed that the source of his power, the source of Dark Side, came from the unknown regions. Over the years he sent people there to gather data etc. And also, I think it was mentioned in the book, that if the observatory can look into the unknown regions, then something from there can look into our galaxy. This Dark Side source is mentioned by Snoke in the novelization. Who knows what's in there. I really like this idea of a hidden presence, or a source of darkness in the unknown. Were lovercraftian. It can be anything. However, such an ambigious story has a terrible potential to fall into an unoriginal and cliché trap imho. The power of this mystery is that it is that - a mystery. Whatever they decide to do, they got shoes to fill, because the whole Unknown Regions mystery has been built up over the years. Everyone wonders about it. Even Thrawn made a big deal of it. The Rey/Harbinger of Doom theory was something from the Knights of Rant. They'd had a "source" tell them that "Ben fell in Rey's place", and they'd theorized that Luke's negative reaction to Rey was him recognizing her as a "harbinger of doom". Anyway, I actually really kinda hope that there's some Bigger Bad out in the UR, not just because it makes Ben's redemption much easier (selfish reasons), but also because there's been so much darn hinting in all of the books -- the Aftermath trilogy, Thrawn, etc. about something really bad out there. It would be nice for the books to actually tie in and not be some dropped thread compared to the movies. MSW just posted something. They asked not to post it where people could be spoiled though. It has to do with a MacGuffin. There’s more just arrived from MSW- what could the item be? The dark saber? 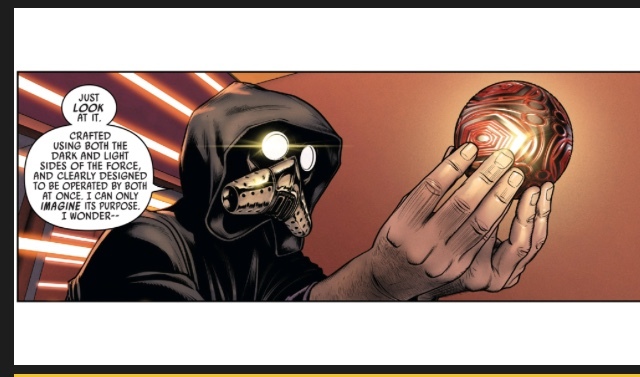 The sphere object that was in Poe comics that had to be opened by a dark and a light sider that Lor San Tekka was after on Neimodia ( that could be link with prequels ). Would that be considered controversial? Probably . Could be something else ? Gosh MSW are on a roll with the leaks . I reckon that’s why we had so many faf leaks in the lead up to this .Its weird - when you get genuine leaks you get a barrage of faf ones in the lead up - almost as if Lucasfilm want to direct your focus elsewhere .... thing is people are gonna listen to MSW even though some of their leaks are rumour and speculation too. I just had a weird thought... what if it's Vader's helmet? Delightful but controversial ???!!! That’s what they say it is in MSW . What on earth could it be?? Lol! Keep the leaks coming MSW.